Steels and cast irons are basically alloys of iron and different other elements in the periodic table. The vast majority of steels and all cast irons contain carbon as a principal alloying element. As a general definition, steel is an alloy of iron, carbon (less than 2 % C), and other alloying elements which is capable of being hot and/or cold deformed into various shapes. On the other hand, cast iron is an alloy of iron, carbon (higher than 2 % C), and other alloying elements and is not generally capable of being hot and/or cold deformed. A cast iron is used in its cast form. Steels and cast irons are the most widely used and least expensive metallic materials. There are several thousands of different steel compositions presently available. A vast variety of terminology is used to differentiate different types of steels. In fact, the way the steels are classified sometimes is quite confusing even to the regular user of steels. However, in many cases, the steels fall into a limited number of well-defined classes. Generally, the carbon and low alloy steels come under a classification system based on composition. The high alloy steels (the stainless, heat resistant, and wear resistant steels, etc.) are being classified according to many different systems, including composition, microstructure, application, or specification. The easiest way to classify steels is by their chemical composition. Different alloying elements are normally added to iron for the purpose of attaining certain specific properties and characteristics. These elements include, but are not limited to, carbon, manganese, silicon, nickel, chromium, molybdenum, vanadium, niobium, copper, aluminum, titanium, tungsten, and cobalt. The general category of carbon and low alloy steels encompasses plain carbon steels, alloy steels, high strength low alloy (HSLA) steels, and a variety of other low alloy steels. There are many low alloy steels which are not designed for just their room-temperature strength properties. These steels have additional properties which are important, such as corrosion or heat resistance and formability. The HSLA steels are a group of low carbon and medium carbon steels which generally use small amounts of alloying elements to attain yield strengths normally higher than around 350 N/sq mm in the hot rolled, cold rolled, annealed, stress relieved, accelerated cooled, direct quenched or normalized condition. In some cases they are called micro-alloyed steels because of the small amounts of vanadium, niobium, and/or titanium which are added for grain refinement and precipitation strengthening. The alloy steels are generally divided into two classes namely (i) low alloy steels, and (ii) high alloy steels. They are divided according to composition. Low alloy steels have alloying elements less than 8 % while high alloy steels have alloying elements more than 8 %. High alloy steels include the corrosion resistant (stainless) steels, the heat resistant steels, and the wear resistant steels (tool steels). The stainless steels and the tool steels fall under an established classification system. 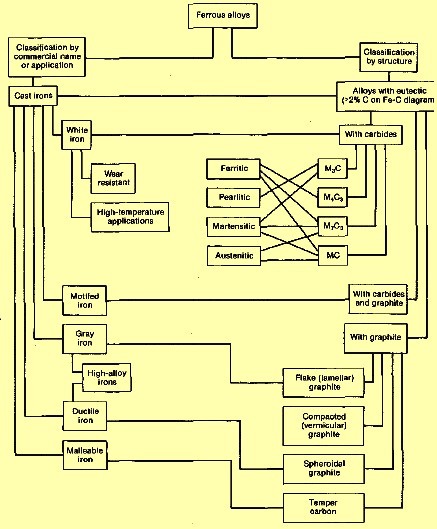 The flow diagram in Fig 1 shows in a general way how steels are classified. On the left side, they are classified by commercial name or application, and on the right side, by microstructure. The term cast iron, like the term steel, identifies a large family of ferrous alloys. Cast irons are also multi-component ferrous alloys, which solidify with a eutectic. They contain major elements (iron, carbon, silicon), minor elements (less than 0.1 %), and often alloying elements (more than 0.1 %). Cast iron has higher carbon and silicon contents than steel. Because of the higher carbon content, the structure of cast iron shows a richer carbon phase than that of steel. Depending primarily on composition, cooling rate, and melt treatment, cast iron can solidify according to the thermo-dynamically metastable Fe-Fe3C system or the stable iron-graphite system. When the metastable path is followed, the rich carbon phase in the eutectic is the iron carbide and when the stable solidification path is followed, the rich carbon phase is graphite. Referring only to the binary Fe-Fe3C or iron-graphite system, cast iron can be defined as an iron-carbon alloy with a carbon content which is more than 2% C. However, silicon and other alloying elements can considerably cause change the maximum solubility of carbon in austenite (gamma phase). Therefore, in exceptional cases, alloys with less than 2 % C can solidify with a eutectic structure and therefore still belong to the family of cast iron. The formation of stable or metastable eutectic is a function of many factors, including the nucleation potential of the liquid, chemical composition, and cooling rate. The first two factors determine the graphitization potential of the iron. A high graphitization potential results in cast irons with graphite as the rich carbon phase, while a low graphitization potential results in cast irons with iron carbide. The two basic types of eutectics, the stable austenite-graphite and the metastable austenite-iron carbide (Fe3C), have wide differences in their mechanical properties, such as strength, hardness, toughness, and ductility. Hence, the basic purpose of the metallurgical processing of cast iron is to manipulate the type, amount, and morphology of the eutectic in order to achieve the desired mechanical properties. Historically, the first classification of cast iron was based on its fracture. Two types of iron were initially recognized namely (i) white cast iron which shows a white, crystalline fracture surface because fracture occurs along the iron carbide plates due to the metastable solidification (Fe3C eutectic), and (ii) gray cast iron which shows a gray fracture surface because fracture occurs along the graphite plates (flakes) due to the stable solidification (graphite eutectic). As the knowledge of the cast iron metallography increased, other classifications based on micro-structural features became possible. These are (i) graphite shape based such as lamellar (flake) graphite (FG), spheroidal (nodular) graphite (SG), compacted (vermicular) graphite (CG), and temper graphite (TG), (ii) matrix based which can be ferritic, pearlitic, austenitic, martensitic, or bainitic (austempered). Another common classification scheme divides cast irons into four basic types white cast iron, gray cast iron, ductile cast iron, and malleable cast iron. 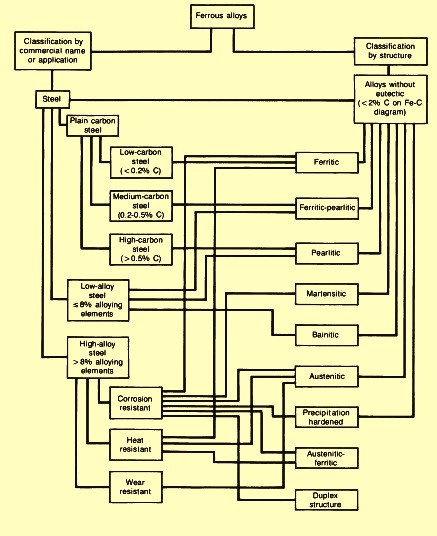 Fig 2 gives the flow diagram for the classification of cast irons according to their commercial names, applications, and structures. Various essential and incidental elements in steels and cast irons are described below. Carbon – it is an essential alloying element. It dissolves in iron to form ferrite and austenite. It combines with iron to form carbide (cementite, Fe3C). The carbide is a component of pearlite. Carbon is added to increase solid-solution strength and hardness as well as to increase hardenability. Hardness and tensile strength increases with the increase in carbon content up to about 0.85 %. Ductility and weldability of steel decrease with increasing percent of carbon. In chilled cast irons, the depth of chill decreases, and the hardness of the chilled zone increases with increasing carbon content. Carbon also increases the hardness of white cast irons. It decreases the transverse breaking strength and increases the brittleness. It also increases the tendency for graphite to form during solidification, especially when the silicon content is also high. Manganese – It is an essential alloying element. It is beneficial to surface quality. It is weak carbide former (greater than iron). It counteracts brittleness caused by sulphur (iron sulphide) through the formation of a manganese sulphide. High levels of manganese produce austenitic steel with improved wear and abrasion resistance. Manganese is added to increase solid-solution strength and hardness as well as to increase hardenability.The increase in strength is dependent upon the carbon content. Increasing the manganese content also decreases ductility and weldability but the effect is less than carbon. Manganese and sulphur are normally considered together in their effects on gray or white cast iron. Alone, either manganese or sulphur increases the depth of chill, but when one is present, addition of the other decreases the depth of chill until the residual concentration has been neutralized by the formation of manganese sulphide. Manganese, in excess of the amount needed to scavenge sulphur, mildly suppresses pearlite formation. It is also a relatively strong austenite stabilizer. Phosphorus – It is usually considered as an impurity. It can be added to low carbon steels to increase strength and hardness. It decreases ductility and notch impact toughness of steels. The adverse effect on ductility and toughness is greater in quenched and tempered high carbon steels. Phosphorus increases resistance to corrosion and improves machinability of free cutting steels. It promotes temper embrittlement. It forms an undesirable iron phosphide (Fe3P) at high phosphorus levels (especially in cast irons). Phosphorous levels are normally controlled to low levels. In non-alloyed cast irons phosphorus is a mild graphitizer. It mildly reduces chill depth in chilled cast irons. In alloyed cast irons, the effects of phosphorus are somewhat obscure. Sulphur – It is usually considered an impurity. It is added to special steels for improved machinability. It decreases ductility and notch impact toughness especially in the transverse direction. Weldability decreases with increasing sulphur content. Sulphur is found primarily in the form of sulphide inclusions. Sulphur levels are normally controlled to low levels except in free cutting steels where sulphur is added to improve machinability. Sulphur is normally the residual element in cast irons, and excess manganese can be used to increase chill depth and hardness. Also, since sulphur promotes the formation of finer and harder pearlite, manganese is often preferred for decreasing or preventing mottling in heavy section castings. Silicon – It is an essential alloying element. It is added to increase solid-solution strength and hardness as well as to increase hardenability. However it is less effective than manganese in increasing as rolled strength and hardness. It strengthens low alloy steels. It is generally detrimental to surface quality in low carbon steels. It is added to liquid steel to remove oxygen (deoxidation). As a result of deoxidation, it can form silicate stringers (silicon dioxide inclusions). It does not form carbide. It improves oxidation resistance. It is added to special steels to improve electrical and magnetic properties as well as hardenability. It increases susceptibility to decarburization. It promotes graphitization in cast irons. In alloy cast irons, silicon is the main reason which determines the carbon content of the eutectic. Increasing the silicon content lowers the carbon content of the eutectic and promotes the formation of graphite upon solidification. Hence, the silicon content is the prime reason for controlling the depth of chill in unalloyed or low chromium chilled and white cast irons. In high alloy white cast irons, silicon has a negative effect on hardenability. It tends to promote pearlite formation in martensitic irons. However, when sufficient amounts of pearlitic suppressing elements such as molybdenum, nickel, chromium, and manganese are present, increasing the silicon content raises the Ms-temperature of the alloy, thus tending to increase both the amount of martensite and the final hardness. Elevated levels of silicon also reduce the rates of scaling and growth by forming a tight, adhering oxide scale. High silicon cast irons (14 % to 17 %) are difficult to cast and are virtually not machinable. These cast irons have particularly low resistance to mechanical and thermal shock at room temperature or moderately high temperature. Nickel – It is an essential alloying element in some iron alloys. It is a ferrite strengthener. It remains in solution in ferrite, strengthening and toughening the ferrite phase especially at low temperatures. It is added to increase solid-solution strength and hardness as well as to increase hardenability. It increases the impact strength of steels. It does not form carbide in steel. It renders high chromium stainless steels austenitic. In cast irons, nickel is almost entirely distributed in the austenitic phase or its transformation products. Nickel promotes graphite formation, and in white and chilled cast irons, this effect is normally balanced by the addition of about one part chromium for every three parts nickel in the composition. Nickel in somewhat larger amounts (up to around 4.5 %) is required to completely suppress pearlite formation, thus ensuring that a martensitic iron results when the castings cool in the moulds. This latter practice forms the basis for production of the Ni-Hard cast irons. All types of cast iron with Ni contents above 18 % are fully austenitic. Chromium – It is an essential alloying element in some low alloy steels and all stainless steels. It is added to slightly increase solid-solution strength and hardness as well as to increase hardenability. It increases resistance to corrosion and high temperature oxidation. It is carbide former (greater than manganese). Its carbides improve wear and abrasion resistance and provide high temperature strength. Complex chromium iron carbides go into solution in austenite slowly hence requires higher heating time prior to quenching. As a hardening element, chromium is normally used with a toughening element such as nickel for superior mechanical properties. Chromium has three major uses in cast irons namely (i) to form carbides, (ii) to impact corrosion resistance, and (iii) to stabilize the structure for high temperature applications. Small amounts of chromium are routinely added to stabilize pearlite in gray cast iron, to control chill depth in chilled cast iron, or to ensure a graphite free structure in white cast iron containing less than 1 % silicon. Chromium influences the fineness and hardness of pearlite and tends to increase the amount and hardness of the eutectic carbides. Therefore, chromium is frequently added to gray cast iron to ensure that strength requirements can be met, particularly in heavy sections. Sometimes, it is added to ductile cast iron for the same purpose. Also, relatively low percentage of chromium is used to improve the hardness and abrasion resistance of pearlitic white cast irons. For developing resistance to the softening effect of heat and for protection against oxidation, chromium is the most effective element. It stabilizes iron carbide and therefore prevents the breakdown of carbide at high temperatures. High levels of chromium stabilize the ferrite phase up to the melting point. Molybdenum – It is an essential alloying element in some low alloy steels and tool steels. It is added to increase solid-solution strength and hardness as well as to increase hardenability. It is strong carbide former (stronger than chromium). It improves high temperature properties, including creep strength. It counteracts temper embrittlement. It raises coarsening temperature of austenite. It enhances corrosion resistance. It forms abrasion resistant particles. Molybdenum in chilled and white cast irons is distributed between the eutectic carbides and the matrix. In graphitic irons, its main functions are to promote deep hardening and to improve high temperature strength and corrosion resistance. In chilled cast irons, molybdenum additions mildly increase depth of chill. It is, however, around one-third as effective as chromium. The primary purpose of small additions (0.25 % to 0.75 %) of molybdenum to chilled cast iron is to improve the resistance of the chilled face to spalling, pitting, chipping, and heat checking. It hardens and toughens the pearlitic matrix. Copper – It is normally considered an impurity or tramp element in most steels, because it promotes hot shortness. It is added to some steels for improved corrosion resistance. It is added in special steels for increased strength and hardness through heat treating (aging). It is very insoluble in iron at room temperature and does not form carbide. Copper has a negative effect during forge welding but it does not affect arc or oxyacetylene welding seriously. Copper can be detrimental to surface quality. Copper is beneficial to atmospheric corrosion resistance when present in amounts more than 0.30 %. Weathering steels are made with copper content greater than 0.30 %. Copper in moderate amounts can be used to suppress pearlite formation in both low and high chromium martensitic white cast irons. The effect of copper is relatively mild compared to that of nickel. Because of the limited solubility of copper in austenite, copper additions probably are usually limited to around 2.5 % or less. Copper is most effective in suppressing pearlite when it is used in conjunction with around 0.5 % to 2.0 % molybdenum. The hardenability of this combination is generally good, which indicates that there is a synergistic effect when copper and molybdenum are added together to cast iron. Cobalt – It is an essential alloying element. It is added to increase strength and hardness. It improves hot hardness by considerably hardening ferrite through solid solution. It is weak carbide former. It is an important element in some tool steels and heat-resistant steels. It decreases hardenability. Tungsten – It is an essential alloying element in some steels. It is added to increase solid-solution strength and hardness as well as to increase hardenability. It promotes hot hardness and hot strength. It opposes softening by secondary hardening. It is strong carbide former. The carbides form hard, abrasion resistant particles in tool steels. Vanadium – It is an important element in micro-alloyed steels. It is added to increase strength and hardness of steel by grain size control (grain refinement) as well as to increase hardenability. It elevates coarsening temperature of austenite. It is strong nitride former. It also forms carbide. It resists tempering and causes marked secondary hardening. Vanadium is one of the primary contributors to precipitation strengthening in micro-alloyed steels. When thermo mechanical processing is properly controlled, the ferrite grain size is refined and there is a corresponding increase in toughness. The impact transition temperature increases when vanadium is added. Vanadium, niobium, and titanium combine preferentially with carbon and/or nitrogen to form a fine dispersion of precipitated particles in the micro alloyed steel matrix. In cast irons, vanadium being is a strong carbide stabilizer increases the depth of the chill. Because of its strong carbide forming tendency, vanadium is rarely used in gray or ductile cast irons for corrosion or high temperature service. Niobium – It is an important element in micro-alloyed steels. It is added to increase strength and hardness of steel by grain size control (grain refinement) as well as to increase hardenability. It is strong carbide former. It also forms a nitride. Niobium can also have a moderate precipitation strengthening effect. Its main contribution is to form precipitates above the transformation temperature and to retard the recrystallization of austenite, thus promoting a fine grain microstructure with improved strength and toughness. Aluminum – It is an important alloying element in nitrided steels and deep drawing sheet steels. It is added to increase strength and hardness of steel by grain size control (grain refinement). It is a common deoxidizer. It forms undesirable alumina inclusions (aluminum oxides). It is a strong nitride former. It does not form carbide in steel. Titanium – It is an important element in micro-alloyed steels. It is added to increase strength and hardness of steel by grain size control (grain refinement). It improves toughness. It is very strong carbide and nitride former. It is important element to tie up nitrogen in steels (protects boron from nitrogen in boron-treated steels). It is also a strong deoxidizer. It fixes carbon in inert particles. It reduces martensitic hardness and hardenability in medium chromium steels. It prevents formation of austenite in high chromium steels. Titanium is also used to achieve improvements in inclusion characteristics. It can combine with sulphur to form titanium sulphides. It causes sulphide inclusions to be globular rather than elongated thus improving toughness and ductility in transverse bending. Boron – It is added to steel to increase hardenability. It enhances the hardenability characteristics of other alloying elements. Boron treated steels are produced with boron in a range of 0.0005% to 0.003%. Whenever boron is substituted in part for other alloys, it is to be done only with hardenability in mind because the lowered alloy content may be harmful for some applications. Boron is a potent alloying element in steel. Boron is most effective in lower carbon steels. It is added to steel for nuclear reactor applications because of its high cross section for neutrons. Boron has also been used as inoculants in cast irons with reported beneficial effects. Nitrogen – It is added to some micro-alloyed steels to increase the amount of nitrides required for strengthening or grain size control (e.g., in a vanadium steel). Nitrogen has also been used as inoculants in cast irons with reported beneficial effects. Lead – It is insoluble in steel. It is is added to carbon and alloy steels by means of mechanical dispersion during pouring for improved machinability. It is environmentally sensitive. Bismuth – It is similar to lead. It is added to special steels for improved machinability. In white cast irons, bismuth is one of the principal carbide inducing inoculants. Bismuth is used in the low carbon cast iron compositions intended for malleabilizing heat treatment. Tin – It is an impurity or tramp element. It promotes temper embrittlement. Antimony – It is an impurity or tramp element. It promotes temper embrittlement. Arsenic – It is an impurity or tramp element. It promotes temper embrittlement. Oxygen – It is not desirable. It combines with other elements (manganese, silicon, aluminum, titanium, etc.) to form oxide inclusions which can degrade toughness and fatigue resistance. It is usually minimized by deoxidation with aluminum and/or silicon and vacuum degassing. Hydrogen – It is not desirable. If entrapped, can cause crack formation (hydrogen flakes, micro-cracks, etc.). It is normally minimized by vacuum degassing or slow cooling after the austenite-to-ferrite transformation. Calcium – It is added for sulphide shape control (combines with sulphur to form rounded, non-deformable inclusions). It is strong deoxidizer. It forms calcium oxide and calcium aluminate inclusions. Zirconium – it is added for sulphide shape control (forms rounded, non-deformable zirconium sulphides). It causes sulphide inclusions to be globular rather than elongated thus improving toughness and ductility in transverse bending. It is strong deoxidizer. It forms zirconium oxide and is a strong nitride former. Cerium – It is added for sulphide shape control (forms rounded, non-deformable cerium sulphide inclusions). It is strong deoxidizer. It is added to the liquid cast iron just before pouring to induce the graphite to form in nodular shape of the desired size and distribution. Magnesium – It is added to liquid cast iron before pouring to induce the graphite to form in nodular shape of the desired size and distribution. Tellurium – In white cast irons, tellurium is one of the principal carbide inducing inoculants. It is extremely strong inoculant. An addition of only about 5 gram/ton (5 ppm) is often sufficient.